Apple's iPhone 5 is "fastest smartphone in the land"
After performing a series of web and raw computing benchmarks, Apple's iPhone 5 was declared the world's fastest smartphone. A report by PC Mag pitted iPhone 5 against previous iPhone models, then against top Android models from Samsung (Galaxy S III, released in June) and Google (Motorola Droid RAZR M, released last week). Apple's latest iPhone 5 easily beat previous years' iPhone models, often by a factor of two. In browser tests, it scored nearly twice as fast as iPhone 4S in Browsermark, where it was more than three times as fast as iPhone 4, even with all phones upgraded to iOS 6 (which improves browser speeds). In general purpose benchmarks, PC Mag said iPhone 5 was more than 2.5 times as fast as iPhone 4S, and over 4.2 times as fast as iPhone 4. Apple continues to sell all three models. In graphics tests, iPhone 5 scored 2.2 times as high as iPhone 4S and more than 8 times as fast as iPhone 4. The scores for all iPhone models are detailed at PC Mag. PC Mag noted that last year's iPhone 4S running iOS 6 on its dual core, 800MHz A5, "is about on par with leading Android 4.0 phones like the Samsung Galaxy S III and the Motorola Droid RAZR M, both of which are using 1.5GHz Qualcomm Snapdragon S4 processors," adding that "obviously, the difference is that Safari is a faster browser than the Android browser." The new iPhone 5 "takes things to the next level," the site wrote, stating that "its Browsermark score is 80 percent higher, and it shows much quicker Sunspider times." In general purpose Geekbench scores, iPhone 5 won overall by a narrower margin, but as the site noted, "the 'memory' and 'stream' scores, both of which test loading data in and out of RAM, come out much better on the Apple device." 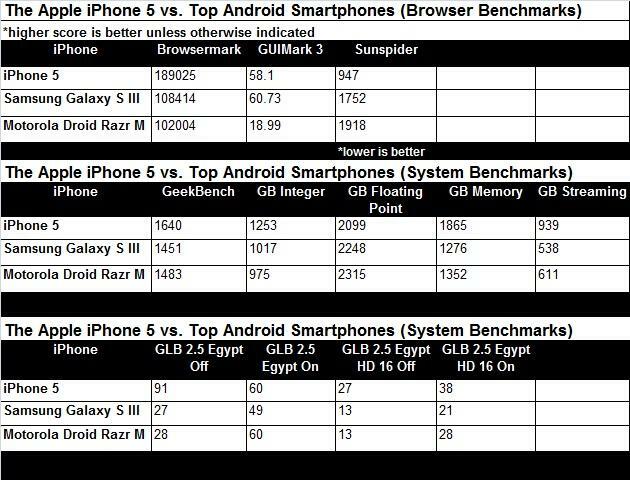 In a graphics-specific processing test, iPhone 5 beat the S III and RAZR M by more than a factor of three. "Based on these benchmarks, the iPhone 5 lives up to the promise of being twice as fast as the iPhone 4S. It's also, for now, the fastest handheld computer sold in the US," the report concluded. 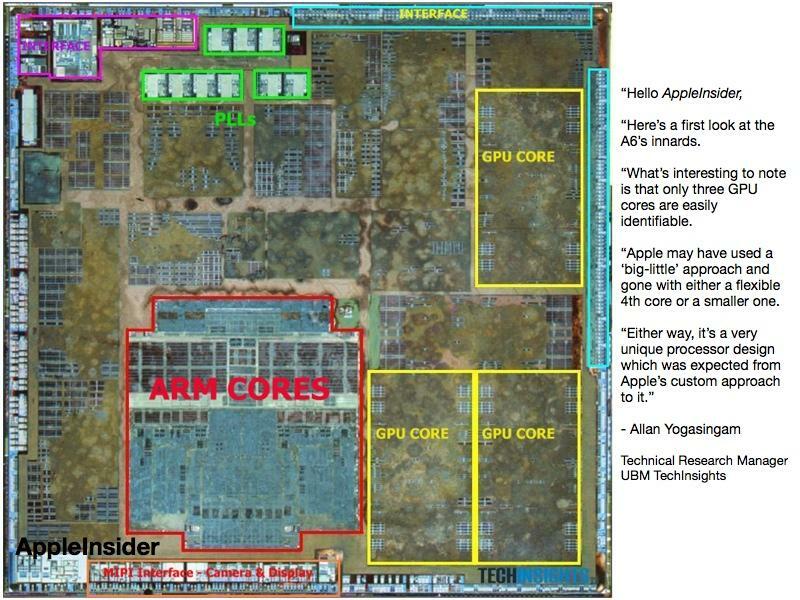 Apple's custom A6 achieves its speed advantage through what TechInsights called "a very unique processor design," which appears to use three graphics cores and an entirely new ARM dual core GPU designed by Apple (pictured above).